If you're here reading Jalopnik, you probably enjoy the act of driving more than just about anything else. But could our days behind the wheel really be numbered? As Gizmodo reported last year, California Gov. Jerry Brown signed a bill into law effectively legalizing driverless cars in that state. Google co-founder Sergey Brin said at the time that he hopes the technology will one day aid people who can't drive on their own, as well as improve traffic safety. So are we well on our way to ceding control of our cars to computers? Well, maybe not yet. As the Bloomberg story notes, there's a lot more to this than just the technology behind the cars themselves. There are also laws, regulations, safety standards and insurance policies that may have to be radically modified to allow this kind of thing. Still, at least some of them seem to be for it — David Strickland, head of the U.S. National Highway Traffic Safety Administration, said he's interested in such a system's potential for reducing crashes. 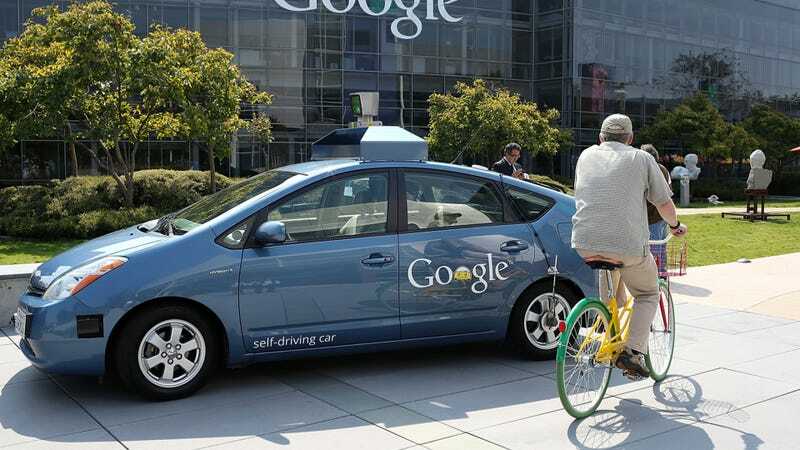 Google says they aren't interested in commercializing driverless cars, just developing that technology itself. And there are still a lot of challenges involved there: if the system fails, nothing will be driving the car, Levandowski told Bloomberg. Also, who's at fault if there's a crash? We already have systems on higher-end luxury cars that warn drivers of impending hazards, and Mercedes-Benz is even putting its autonomous steering assist on the new S-Class. Driverless cars are coming — but we'll just have to wait and see what shape they take in the coming years.